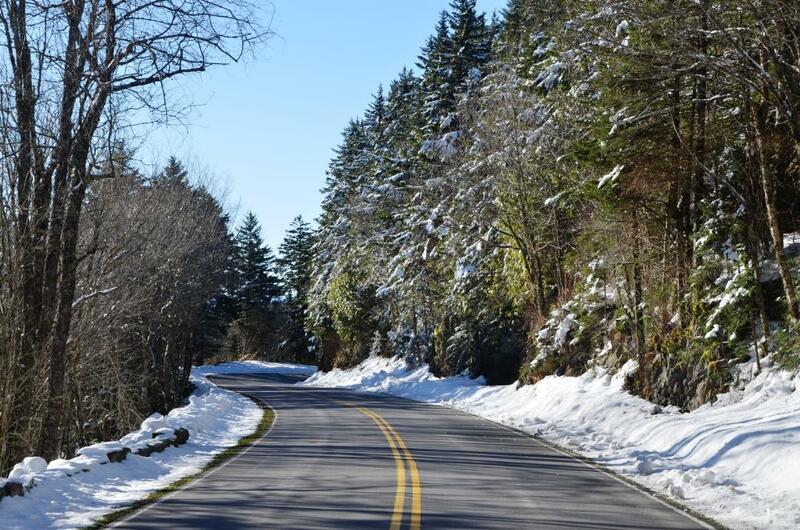 The routes listed below lead to the Great Smoky Mountains National Park, for Clingmans Dome directions turn off Newfound Gap Road 0.1 mile south of Newfound Gap and follow the 7-mile-long Clingmans Dome Road to the large parking area at the end. Clingmans Dome directions are also available from any National Park Service visitor center, such as Sugarlands or Oconaluftee. The road to Clingmans Dome generally follows the Tennessee and North Carolina state line. Clingmans Dome directions from Gatlinburg, TN entrance – From interstate highway I-40 take Exit 407 (Sevierville) to TN-66 South. At the Sevierville intersection, continue straight onto US-441 South. Follow US-441 through Sevierville and Pigeon Forge into park. Clingmans Dome directions from Townsend, TN entrance – From the north: From interstate highway I-40 in Knoxville take Exit 386B to US-129 South to Alcoa/Maryville. At Maryville proceed on US-321 North/TN -73 East through Townsend. Continue straight on TN-73 into the park. From the south: From interstate highway I-75 take Exit 376 to I-140 E towards Oak Ridge/Maryville. Merge onto I-140 E via Exit 376B towards Maryville. Turn onto US-129 South (Alcoa Highway) at Exit 11A and travel towards Alcoa. Turn onto TN-35 and follow it to US-321 North. Follow US-321 North/TN -73 East through Townsend. Continue straight on TN-73 into the park. Clingmans Dome directions from Cherokee, NC entrance– From the north: From interstate highway I-40, take Exit 27 to US-74 West towards Waynesville. Turn onto US-19 and proceed through Maggie Valley to Cherokee. Turn onto US-441 North at Cherokee and follow the road into the park. From the south: Follow US-441/US-23 North. At Dillsboro merge on US-74 West/US-441 North. At Exit 74 merge onto US-441. Follow US-441 through Cherokee and into the park. Regional Airports – The nearest major airport in Tennessee is the McGhee-Tyson Airport (TYS) located just south of Knoxville in Alcoa. This airport is approximately 45 miles west of the Gatlinburg entrance to the park. In North Carolina, the Asheville Regional Airport is located approximately 60 miles east of the Cherokee entrance to the park. Public Transportation – There is no public transportation to the national park from major cities in the area. However commercial businesses operating in the smaller communities surrounding the national park offer transportation from cities such as Knoxville, TN and Asheville, NC to the park. Information is available from local Chambers of Commerce. The City of Gatlinburg offers trolley service from Gatlinburg, TN to Sugarlands Visitor Center and Elkmont during summer and fall. Cherokee Transit offers bus service from Cherokee, NC to Gatlinburg and Pigeon Forge, TN during summer and fall. Clingmans Dome directions are well marked in the Great Smoky Mountains National Park and available at any of the park visitor centers.